ButterKnife is a view "injection" library for Android which uses annotation processing to generate boilerplate code for you. A fast dependency injector for Android and Java. AndroidAnnotations is an Open Source framework that speeds up Android development. It takes care of the plumbing, and lets you concentrate on what's really important. By simplifying your code, it facilitates its maintenance. RoboGuice smoothes out some of the wrinkles in your Android development experience and makes things simple and fun. It's a Google Guice on Android. Butter Knife-esque view binding for Kotlin. Tiger - the fastest java dependency injection framework. 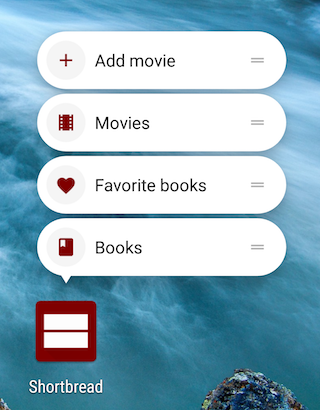 Android library that generates app shortcuts for activities and methods annotated with @Shortcut. No need to touch the manifest, create XML files or use the shortcut manager. Just annotate the code that you want the shortcut to call. Extra "injection" library for Android which uses annotation processing to generate code that does direct field assignment of your extras. Toothpick is a scope tree based Dependency Injection (DI) library for Java. Intent and Bundle "injection" library for Android which uses annotation processing to generate boilerplate code for you. This library is based on ButterKnife and Dagger. Feather is an ultra-lightweight dependency injection (JSR-330) library for Java and Android. It's main goal is to deliver easy-to-use basic dependency injection functionality with high performance and - taken to the extreme - small footprint. Transfuse is a Java Dependency Injection (DI) and integration library geared specifically for the Google Android API. DecleX is an open source framework that aims to get closer to a fully Declarative Language for Android Development. It facilitates the writing and the maintenance of applications, reducing the amount of code that should be written. It uses a clean Pseudo Java Code and Java Annotations, getting rid of the verbosity of the Java Language itself. Layout inflation library for Android which uses annotation processing to write the code you don't want to write and simplify your compound views. Using Java Annotations and Reflection, this library will allow you to replace some of annoying boilerplate setup from your Activities, Fragments, and Views with an annotation based approach. Spork is an annotation processing library to speed up development on your projects. It allows you to write less boilerplate code to make your code more readable and maintainable. An integration Module for injecting Google Architecture Components' ViewModel into Dagger2-injected Android activities and fragments. Inject automatically your Activities & Fragments, just with a simple annotation. The fastest view-injection Android library that populates View Holders. Using annotation processing, this library generates findViewById(), saves code by connecting view-related methods to your views without need to findViewById and then setOnClickListener, and some other smart features that make it amazingly easy to use. Simple View injection framework to be used as a tool for learning compile-time Annotation Processing. A lightweight dependency injection framework for Android. Lightweight Dagger 2 scoped component management library. Light version of ButterKnife's concepts. Common scopes, qualifiers, modules and few utilities for Dagger 2. Tiny and nice injections syntax sugar for Android. If you're using heavy injection frameworks just to inject views and resources try this. Tiny lifecycle aware dependency provider for Android. It's inspired in the ViewModelProviders from Android Architecture Components and it relies on Service Tree to retain instances organized according to the structure and active components of your application. It aims to manage object creation in a smart way. GhostFish is a very lightweight and fast dependency injection container for Android.